The New York Film Academy is training the next generation of journalists to be prepared to navigate the evolving landscape of journalism in the 21st Century. Working with top broadcast and investigative journalists, NYFA created an intensive hands-on curriculum to address the pressing demand for multi-skilled, independent journalists on broadcast television, cable, and the internet. Students are introduced to cutting-edge digital technology and methods now used professionally in the field. Today’s journalists are expected to research, write, shoot, produce, edit, and even appear on camera in their own field reports and investigative segments. In small crews or even solo, these intrepid reporters are the fastest growing sector of the industry. Our journalism programs will challenge students to practice and develop these skills in preparation to enter this exciting and competitive field. Through study and hands-on practice, NYFA students are trained in the fundamental principles, techniques, and craft of contemporary journalism through a combination of lecture, demonstration, in-class hands-on production, and project-based work. Each student produces a series of prerecorded news projects, shot both single and multi-camera and edited on Avid Media Composer. Students who successfully complete this program will have learned to research, produce, shoot, write, report, narrate, and edit news projects suitable for broadcast and the internet. The first semester provides a foundation in journalistic skills in this digital age that students apply to more advanced work in the second semester, where the focus is on NYFA News, our own biweekly news magazine. Students learn the process of show production as they rotate positions that include anchor, reporter, writer, producer and director. On top of shooting and editing stories, broadcast journalism students work in a variety of positions in a studio space specifically designed for our school. Students take turns handling key on-camera and control room assignments, as well as shadowing industry professional who explain the intricacies of working in a deadline-driven industry. 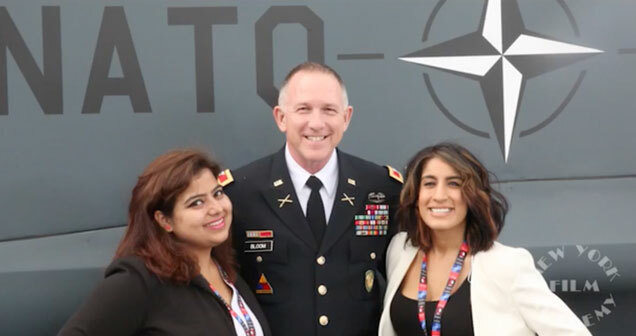 Broadcast Journalism student Urvashi Barua and alumna Alisa Rajkitkul joined the White House Press Corps to cover the NATO Summit alongside correspondents from CNN, Fox News, NBC, CBS, and ABC. Bob Haberl: Having worked in journalism for more than 40 years, Haberl first cut his teeth working as a radio tech during the Watergate scandal when he was right out of college. He went on to work as a television reporter in Jacksonville, Florida, and Philadelphia before becoming an executive producer at ABC News. While there, he covered everything from the fall of the Berlin Wall to Nelson Mandela's release from prison, helping him to earn seven Emmy Awards. As producers, broadcast journalism students have to identify and make arrangements for their subjects, choose and secure locations, prepare equipment, arrange the preparation and setup of the locations, and make final technical checks. Students are required to edit and deliver their projects for viewing and critiques. In the VO (voice-over) project, students use video and natural sound to help tell a story. Each student chooses a topic, shoots video, writes copy, narrates and edits a 30 second segment. The VO encompasses the six skills at the very core of broadcast journalism: finding the story, reporting the story, shooting the story, writing the story, recording the narration for the story, and editing the story. Each student introduces a newsworthy idea, initially as a “story pitch.” Students shoot their own footage, conduct interviews, write, edit and narrate. They also learn how to do “stand-ups.” The stand-up is the on-location appearance of the reporter on-camera. Graphic elements are developed for the story, including (but not limited to) lower-third ID’s and story locators. The News Package runs approximately 2 minutes in length. An in-depth interview is an important way to use a character to tell a story. Students learn to identify good interview subjects, appropriate locations and work on the skills and techniques of asking questions that elicit news, a relevant story and/or important information. The “in their own words” piece will run approximately 4 minutes. “Magazine-style” news programs, such as “60 Minutes” and “Dateline NBC,” feature long-form stories. These reports, running 6 minutes or longer, are more complex than the standard news package, introducing multiple characters through the use of classic narrative storytelling. While a news package incorporates brief interview excerpts (“sound bites”), the long-form story allows for the inclusion of more thoughtful comments. A major challenge is developing a story that can sustain viewer interest and engage diverse audiences. When applying for a job, potential employers will ask candidates to provide online links to their Resume Reel. This brief compilation of stand-ups, story segments and interview excerpts is often a key deciding factor when it comes to scheduling a candidate for an in-person job interview. The Feature Story is a mainstay of virtually all nonfiction television genres. Unlike “breaking news” stories, in feature stories there is less emphasis on timeliness. Instead, unique characters and unexpected events often form the basis of the report. They can have strong emotional content, and run the gamut from hilarious to tragic. Sometimes referred to as “back of the book” stories, they are positioned as “evergreens,” much like trees that remain green year-round. A good feature story can run today, tomorrow, next week or next month. The main character in this two-minute story should be empathetic and engaging. The final assignment of the first semester is also the most ambitious. The Special Report (also called Team Coverage) is a an essential element in broadcast news programs. Working as a group, students tackle different aspects of a major story. When conducting interviews, each student asks questions that elicit information useful in one or more segments. Similarly, when shooting on-location footage, students consider the visual requirements of the entire series, not just their own segment. In this way, students are prepared for second semester coursework, which places a premium on collaboration and cooperation. In second semester, students gain fuller understanding of news coverage from inception to broadcast as they produce their own biweekly news magazine. There is focus on both the practice and theory of studio and location reporting, and the combination of these elements from every aspect of production. There is also a strong emphasis on digital journalism, and the use of new and emerging media in the news industry. Broadcast Production Workshop comprises the bulk of second semester class, production time and projects. Students devote much of their time to story research and development, and preparation and production of the biweekly broadcast. The instructor acts as executive producer while students fill the roles of show producers, assignment desk editor, anchors, reporters, writers and field producers. In these teacher-supervised labs, live and remote production methods are put into practice. The instructor assigns stories to student news reporters and the accompanying crews with real-time deadlines for live coverage. This Production Workshop will break down the various elements of news broadcasting operations and build towards combining the elements into a complete show involving the control room and studio, live remotes and the employment of the various associated technologies. At times, students will be reporting live. 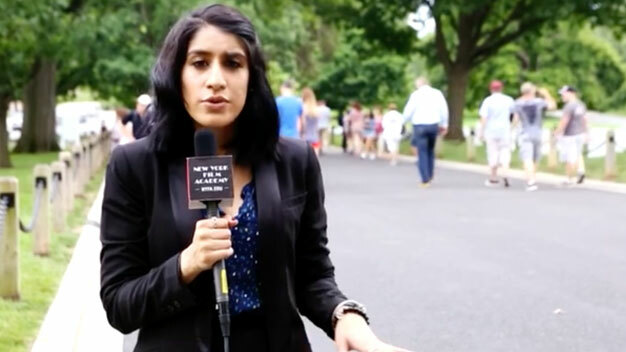 The program they create, “NYFA News,” is produced biweekly. Additional topics include in-studio and in-field communications, and well as live sound mixing, and advanced editing tools and techniques using Avid Media Composer. In Production Workshop, students build a substantial portfolio that can be used to develop a professional reel for presentation to potential employers. Compelling, first-person narratives are an essential aspect of digital journalism. While some of the production skills are similar to conventional news programming, the reporter in this form of storytelling becomes a central character in the story who shares insights and discoveries directly with the audience. This is not “personal journalism,” as it is based on the same ethical framework taught during the first semester. Successful digital news outlets generally hire trained multimedia journalists (MMJs) who have both technical as well as storytelling skills. The course requires students to develop a distinctive “editorial voice,” a point-of-view that distinguishes his/her work from others. Following extensive voice, movement and presentation coaching, students graduate with new confidence in their on-air persona as well as reporting skills. Student will also incur additional expenses, this varies depending on how much of their work they choose to print and the scale of their project.